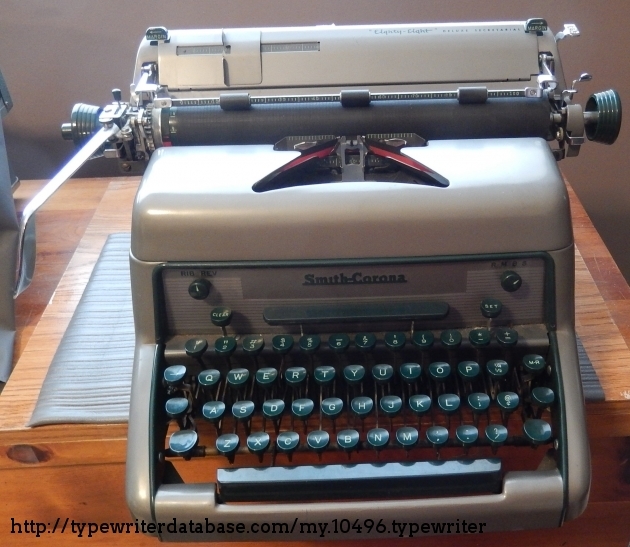 Gerald Ambrose 1954 Smith Corona Eighty-Eight Deluxe Secretarial Serial # 88F4084861-11 1954 Smith Corona Eighty-Eight Deluxe Secretarial typewriter, Serial # 88F4084861-11 Gerald Ambrose's 1954 Smith Corona Eighty-Eight Deluxe Secretarial typewriter. 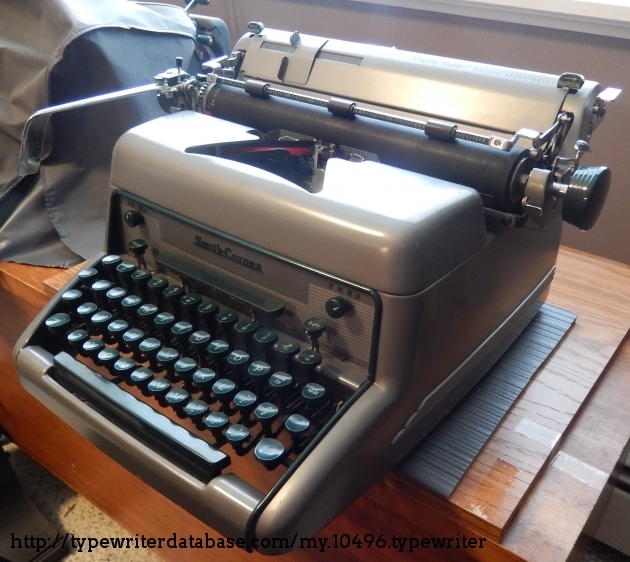 2018-04-05 2018-07-02 From the Virtual Typewriter Collection of Gerald Ambrose: 1954 Smith Corona Eighty-Eight Deluxe Secretarial Serial # 88F4084861-11 So, my grandfather and I were driving around and we spotted this sign that said 'Indoor Flea Market,' so we turned around and went in. Not more than a few steps in, I spotted this '50s Smith-Corona sitting a shelf with a S-C handbook. I gave it a quick try, trying also, to remember about the gloss finish on a '50s S-C Standard. The price tag was hard to read, but it looked like $49.99. Not too bad and I ended up getting it for somewhat less. Everything works as intended, with the one exception being the variable line adjuster that just needed some cleaning and oil. Overall, the machine is a nice one to use, though the action is a bit heavy, but still a good machine nonetheless. Will upload some better pictures soon. So, my grandfather and I were driving around and we spotted this sign that said 'Indoor Flea Market,' so we turned around and went in. 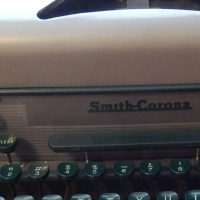 Not more than a few steps in, I spotted this '50s Smith-Corona sitting a shelf with a S-C handbook. 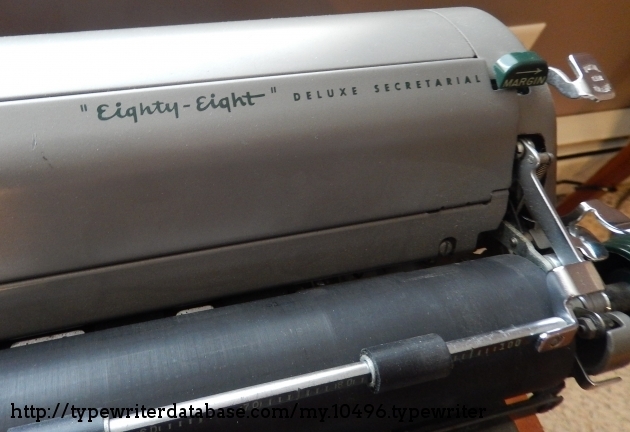 RESEARCH NOTE: When researching the Smith Corona Eighty-Eight Deluxe Secretarial on a computer with lots of screen real estate, you may find that launching the Smith Corona Serial Number page and the Smith Corona Eighty-Eight Deluxe Secretarial By Model/Year/Serial page in new browser windows can give you interesting perspectives on changes throughout the model series.